The Battle of Guillemont was a British assault on the German-held village of Guillemont during the 1916 Battle of the Somme. Guillemont lay on the right flank of the British sector where it linked with French forces and by holding it, the Germans prevented the Allied armies from operating in unison. Guillemont came in range of British forces following the Battle of Bazentin Ridge on 14 July and it was subjected to a number of costly attacks in late July and August. This sector contained a number of German strongpoints - Delville Wood, Falfemont Farm, the villages of Guillemont, Combles and Maurepas - each providing protection for the other. On 18 August a combined British-French offensive was launched on the sector with three British corps attacking around Guillemont while the French attacked Maurepas. The British managed to seize Guillemont Station but otherwise failed to reach their objectives. The decisive attack came on 3 September with the British 20th (Light) Division and 47 Brigade of the 16th (Irish) Division capturing Guillemont while the British 5th Division advanced on the right, eventually taking Falfemont Farm on 5 September. German units fought to the death in the frontline trenches until overwhelmed. 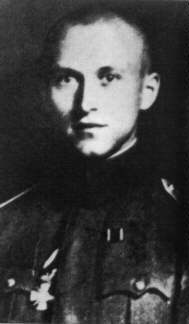 Fusilier Regiment 73 of Lieutenant Ernst Jx�nger was involved in the defence of Guillemont and in his memoirs, Storm of Steel, he describes the dreadful conditions the Germans had to endure. Regiment 73's history states : "Nobody from 3rd Company can provide a report - all the men were killed, as was every officer". There were 5 survivors of 5th Company Infantry Regiment 76. The capture of Guillemont weakened the German hold on this sector. Delville Wood was finally secured and the neighbouring village of Ginchy fell relatively quickly to the 16th (Irish) Division on 9 September. By 15 September the British were in a position to mount their next major offensive on a broad front - the Battle of Flers-Courcelette.